Size: Each map: 14.1 x 18.1 inches (357 x 460 mm). Amsterdam 1630. A fine set of 6 maps of England. Five maps divide England into parts, together with a map showing the islands in the Channel and Irish sea. 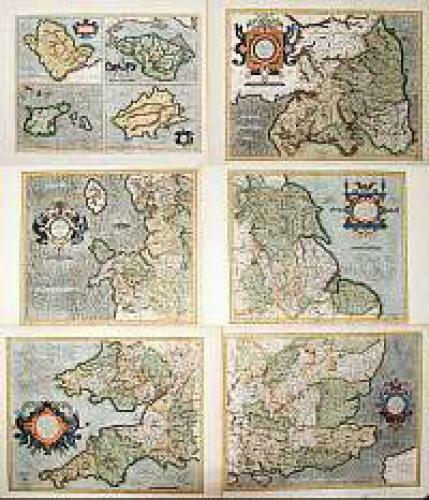 These map plates were originally engraved by Gerard Mercator and they were bought in 1604 by Jodocus Hondius. Hondius, with his sons, Jodocus II and Henricus, published enlarged editions which dominated the map market for the following twenty to thirty years. In very good condition with rich colours. A good and strong impression.